Augustine's life as a young man was characterized by loose living and a search for answers to life's basic questions. He would follow various philosophers, only to become disillusioned with their teachings. For nine years he was associated with the Manichean sect. But he gradually became aware that Manicheism was unable to provide sastisfactory answers to his probing questions. At this time, Augustine was teaching rhetoric in Milan. He went to hear the preaching of Saint Ambrose, the Bishop of Milan. At first he went only to hear Ambrose's eloquent style of speaking. But the Bishop's preaching led Augustine to a new understanding of the Bible and the Christian Faith. Some time in the year 386, Augustine and his friend Alypius were spending time in Milan. While outdoors, Augustine heard the voice of a child singing a song, the words of which were, "Pick it up and read it. Pick it up and read it." He thought at first that the song was related to some kind of children's game, but could not remember ever having heard such a song before. Reading this scripture, Augustine felt as if his heart were flooded with light. He turned totally from his life of sin. 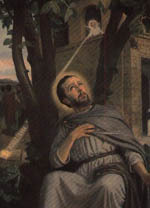 He was Baptized by Ambrose during the Easter Vigil April 24, 387. His friend Alypius and his son Adeodatus were Baptized at the same time. Later, reflecting on this experience, Augustine wrote his famous prayer: You have made us for yourself, Lord, and our hearts are restless until they rest in you. He went on to become a powerful influence on the spirituality and theology of the Christian Church.